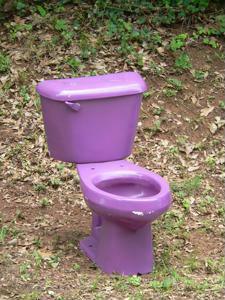 All over the town of Keizer, Oregon, residents have been spotting a particular purple toilet on lawns and front yards. At first glance, it may seem like a strange prank is being pulled, but it is actually a strange fundraising trend that has gained steam in the small town. According to the Statesmen Journal, Whiteaker Middle School students Brendan Van Voorhis, Griffin Gosling and Travis Holt and other National Honor Society students have used the commode to raise money throughout the community. For only $20, the students will drop off the purple toilet on residents' lawns featuring a "Flush Away Cancer" message on the front that shows their support to defeat this disease. "It's a good way to earn money to help a cause," Gosling told the news source. Purple is the official color of the American Cancer Society's Relay for Life and signifies every type of cancer. The event is a fundraiser for a variety of cancer charities and is a community-wide relay event that brings together cancer survivors and supporters, according to RelayForLife.org. The purple toilet idea was envisioned by the students as a way to complete their community service time and help a good cause, and the public response for the toilet has been overwhelming. The bowl has already made appearances at 14 homes in Keizer and has an extensive waiting list. The students are raising money to improve the children's activities at the event, and the money raised will pay for a dunk tank, bounce house and obstacle course that are sure to keep kids busy while parents are walking in the Relay for Life. The students' goal is $500, and they are well on their way to completing their goal. "Somebody always wants it," Mary Holt, Relay for Life children's activity chairperson, told the news source. "We had kids' activities last year [for the first] time, and I wanted to keep it going." The hope for the middle school students is that their purple toilet will help to improve the public exposure of the event and hopefully improve the turnout. What started off as a small-scale initiative to earn money for a worthy cause has now become a small town phenomenon that may just become an annual tradition. With only a few hundred dollars left to go and a packed waiting list, the students should be able to exceed their goal.